"Transcultural Interpretation and the Production of Alterity: Photography, Materiality and Mediation in the Making of 'African Art'"
Sylvester Okwunodu Ogbechie is Professor of Art History and Archictecture at the University of California at Santa Barbara. He specializes on the arts and visual culture of Africa and its Diasporas, especially in terms of how art history discourses create value for African cultural patrimony in the age of globalization. He is the author of Ben Enwonwu: The Making of an African Modernist (University of Rochester Press, 2008: winner of the 2009 Herskovits Prize of the African Studies Association for best scholarly publication in African studies), Making History: The Femi Akinsanya African Art Collection (Milan: 5 Continents Editions, 2011), and editor of Artists of Nigeria (Milan: 5 Continents Editions, 2012). He is the director of Aachron Knowledge Systems, and founder and editor of Critical Interventions: Journal of African Art History and Visual Culture. He organized and coordinated the First International Nollywood Convention and Symposium (Los Angeles, June 2005) that evaluated new media in contemporary African Visual Culture from the perspective of the internationally acclaimed Nigerian Video Film Industry. He subsequently founded the Nollywood Foundation in 2006 to formalize study and research of this phenomenon and produced annual international Nollywood conventions from 2005 to 2009. 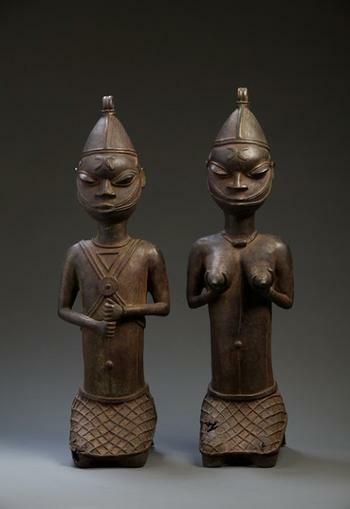 Image caption: Edan Ogboni (male and female pair), Yoruba peoples (Ijebu-Igbo), Nigeria, Bronze, 20th Century. © Femi Akinsanya African Art Collection.